Transition Design is concerned with seeding and catalyzing intentional, systems-level change, which will take many years, dozens of decades, or even generations, and require a deep understanding of systems and their dynamics. In particular, Transition Design is concerned with three kinds of systems: 1) living systems (the environment); 2) socio-technical systems (tangles of people, technology and the built world) and 3) wicked problems which are systems problems. Both socio-technical systems and wicked problems exhibit characteristics of living systems: they exist at multiple levels of scale, are interconnected and interdependent, are self-organizing, display emergent properties, and their dynamics are governed by feedback loops. Therefore changes in in one area of a system, ramify throughout in unpredictable ways. Systems are so ubiquitous and our interactions with them so pervasive, we don’t really see them, and therefore don’t understand them very well. But these unnoticed systems produce their own patterns of behavior over time, become entrenched and intractable, and are therefore unintentionally directing our societal transitions toward unsustainable futures. Transition Design aspires to develop an approach to help shift the trajectory of these systems through strategically placed, designed ‘interventions’ over short, mid and long horizons of time. Transition Design resembles Chinese acupuncture in its approach. Acupuncturists look for points of intervention that have the greatest potential to transition the system back into balance and health. Where the needles are placed can seem wildly counter-intuitive, but is actually based upon a deep understanding of the body’s systems dynamics. Transition Design proposes a similar approach to seed and catalyze the transition of our socio-technical-ecological systems toward sustainability. A group of scientists, engineers and researchers in northern Europe (STRN) have been mapping the anatomy of historical socio-technical transitions for nearly two decades—essentially providing a roadmap for initiating transitions. We believe this can be supplemented by approaches that seek to understand how social practices, human behavior and worldview can also be strategies for change and designed interventions. The Transition Design Framework provides an evolving structure within which to integrate myriad knowledge sets, tools and approaches useful in designing for complex systems. Social organizations, natural ecosystems and even wicked problems are all examples of complex systems that Transition Designers must design for and within. The study of the dynamics within these ‘living systems’ (such as emergence, resilience, feedback, sensitivity to initial conditions, self organization and the dynamic/temporal relationship between ‘whole’ and ‘part’) has shown that they have great relevance for design, but can often seem counter intuitive. If systems dynamics can be better understood, they can be leveraged by Transition Designers to seed, catalyze and direct systems level change. A brief lecture will introduce the concept of systems which will be followed by a discussion of the assigned texts. How does a complex system differ from a ‘simple’ or ‘closed’ system? How, in framing design problems within tight contexts, do we ‘deny’ the complexity of the system we are designing in and for? Can you think of ways that the inherent dynamics within complex systems can be leveraged in design solutions? How do the properties of chaos and complexity change how we think about change? How we stage design interventions? What are the implications of principles such as self-organization and emergence for designers? Breeze, Nick. 2019. Its the Non-linearity Stupid. In The Ecologist: The Journal for the Post-Industrial Age. Accessed Jan. 2019. Dubberly, Hugh. 2008. Design in the Age of Biology: Shifting From a Mechanical-Object Ethos to an Organic-Systems Ethos. Written for Interactions Magazine. Wicked problems are a class of ‘unsolvable’ problem identified by planner Horst Rittel in the 20th century. Problems such as climate change, drought, poverty, crime, loss of biodiversity, forced migration, the opioid epidemic and many more, are characterized by high degrees of social complexity, involve multiple stakeholders with conflicting agendas, straddle disciplinary boundaries, require multiple interventions over long horizons of time and will necessitate sustained behavioral changes. Traditional design approaches, characterized by linear processes and de-contextualized problem frames, whose objective is the swift realization of predictable and profitable solutions, are inadequate for addressing this type of problem. Complex, wicked problems are “systems” problems, meaning they are ill defined, exist at multiple levels of scale, are interconnected and interdependent and any intervention in one part of the system, ramifies elsewhere in unpredictable ways. Wicked problems are continually evolving and cannot be solved by a single solution from a single expert, discipline or profession. Most significantly, this type of problem took a long time to become “wicked” and will therefore take a long time to resolve; potentially dozens of years or many decades. Stakeholder Relations: Wicked problems are permeated by social dynamics; multiple stakeholders with conflicting agendas, each of whom has a different view of the problem (and therefore a different idea of how to solve it). We use the term stakeholder to refer to anyone who has a ‘stake’ or interest in an issue related to the problem or is affected by the problem. The emerging Transition Design approach emphasizes the need to identify all stakeholder groups (including the environment and members of the ecosystem) and apply a range of methods to understand their fears/concerns and hopes/desires. Transition design differs from other design-led approaches in its emphasis on understanding the assumptions, beliefs and cultural norms related to the problem, for each stakeholder group. Understanding stakeholders’ deepest feelings about the problem and the way in which their individual and collective belief systems (worldviews) affect their view of the problem is fundamental to resolving differences, for example by transcending differences in the present through the co-creation of visions of desirable futures. Often, the barrier to addressing a wicked problem isn’t that people can’t agree on what solution to implement—they can’t agree on what the problem even is. Transition Design draws on approaches from the social sciences (in particular political, peace-keeping approaches) to place stakeholder concerns and collaboration at the heart of the problem solving process. There are many well documented approaches used to identify and resolve stakeholder relations, including Needs-Fears Mapping, Conflict Analysis Tools, and Multi-Stakeholder Processes, to name a few. These approaches delve more deeply into understanding stakeholder differences, mindsets and relations than do traditional design approaches (such as actor and stakeholder maps which are often determined from the consultant/ expert designer’s or client’s point of view). They offer collaborative approaches for resolving conflicts and facilitate more meaningful collaboration and understanding. What they lack however, is a design-led component that can contribute to tangible action (projects and initiatives) through the prototyping and implementation of designed interactions, communications and artifacts that can educate, clarify and facilitate new behaviors and outcomes. Transition Design proposes that many stakeholder conflict resolution methods from the social sciences could inform a new, design-led approach that mediates stakeholder relations as a crucial step in addressing wicked problems. 1. The involvement of more actors provides a broader range of expertise and perspectives. This means problems can be analyzed better, based upon several different viewpoints. 2. Such analyses can lead to a more comprehensive strategy to address complex conflict situations. 3. MSPs provide the opportunity for greater understanding of different stakeholders’ capacities, roles and limitations, thus contributing to better coordination of interventions. 4. MSPs can help organizations pool and share resources, including skills, funding, staff time, and logistical or administrative resources. 5. The involvement of multiple stakeholders can be conducive to public outreach and awareness raising at different levels simultaneously, increasing the reach from grassroots to policy mobilization. In this way, they have potential for multiplier effect when the key messages of the process are communicated to the participants respective constituencies. 6. MPS can contribute to building trust among diverse stakeholders, and enable relationships that can outlast the process itself. 7. They can provide a platform for much needed capacity building among practitioners at different levels. 8. Sharing skills and knowledge can enable participants to see problems in a new way, which is also conducive to innovation. For the purposes of Assignment #1b groups will simply list as many stakeholder groups affected by the wicked problem as possible, then ‘map’ relations among 3 stakeholder groups. Assignment #1a and #1b will be given in the last 20 minutes of this class. Groups should bring the research they have conducted on their wicked problem to class and refer to Assignment #1a & b pages of this website, prior to class. It is essential to review the Additional Resources page for this class as it contains an important overview for both mapping your wicked problem and stakeholder groups. Students sometimes are confused about what constitutes a stakeholder group and the videos on this page will help clarify the distinction. Is it possible to understand and visualize the entirety of a wicked problem? If not, then why should we try? In what ways do ‘wicked problems’ manifest at multiple levels of scale (systems levels)? What is the significance of this insight? 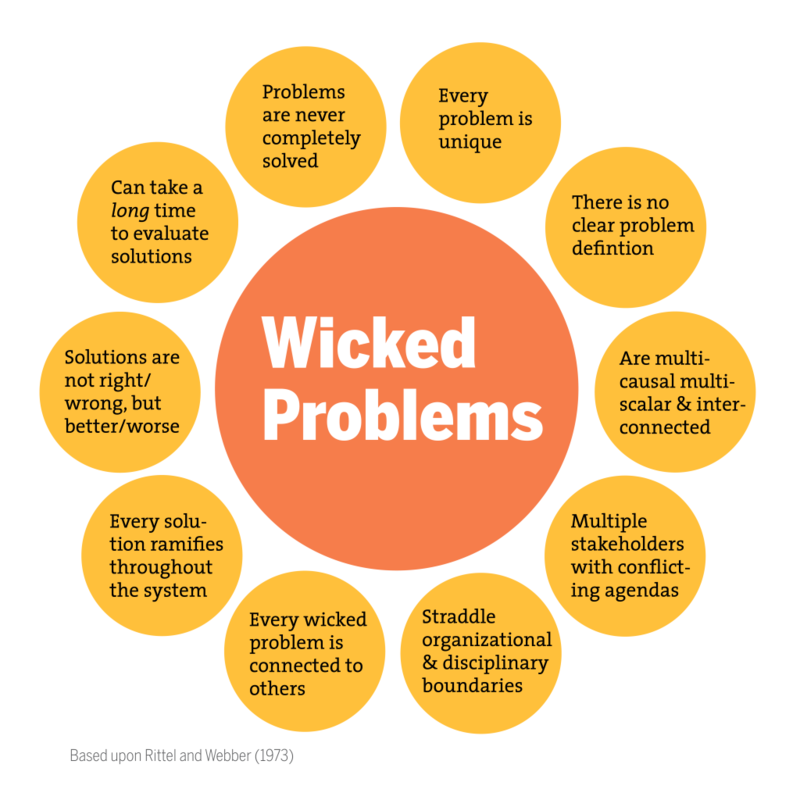 What are examples of global wicked problems that are interrelated and interdependent? In what ways are traditional design problems/solutions related to and embedded within wicked problems? How does an ability to see and understand wicked problems challenge a designer’s ability to frame a discrete problem at a lower systems level? Is there a design equivalent to a ‘trophic cascade’? How would you characterize or distinguish between the consequences of a wicked problem and the root cause? Why is it important to make a distinction? Assignments 1a and 1b: Mapping Wicked Problems & Stakeholder Relations will be introduced in the last 20 minutes of class. Teams should bring the research they have been conducting on their wicked problem to class and after a brief introduction, will begin to ‘map’ the wicked problem and speculate on the number of type of stakeholder groups affected by the problem. Large project ‘canvases’ will be provided as the basis for the assignments and students will use post-its to map the problem in 5 key areas: 1) Social issues; 2) Environmental issues; 3) Economic issues; 4) Political issues; 5) Infrastructural/technological issues. A complete description of this assignment can be found on the Assignment 1a & 1b page of this website. Globalization — the system of policies and the process of deregulation designed to facilitate the trade of goods and services across the planet — and neoliberalism — the body of ideas and beliefs that underlie globalization —are considered, almost universally amongst economists, politicians and the media, to be necessary for the maximization of economic growth. It is assumed that such growth is the most effective way to create wealth and raise living standards. Over the last few decades, globalization and neoliberalism have led to the development of a global marketplace in which national economies are increasingly interdependent and integrated; in which the responsibility for local and national government to ensure the well-being of their citizens has been greatly diminished; and in which many collectively owned assets and services have been privatized and absorbed into the market. In short, globalization and neoliberalism have had a dramatic and impactful influence on the ways in which much of the world’s population live their lives and meets their needs. But globalization is at the root of, or has exacerbated, many wicked problems. Globally unregulated economic growth — in which the expansion of Gross Domestic Product (GDP) and the size of shareholder dividends are the primary criteria of success — has frequently damaged or destroyed the social and ecological fabric at local, regional and planetary scales; it has given rise to enormous disparities in wealth and opportunities, leaving much of the world’s population impoverished and economically insecure; it has contributed to the displacement of large populations and has been a factor in forced migration; it has undermined democracy by concentrating financial power in the hands of a tiny minority; it has contributed to civil and international conflict in the pursuit of resources and materials; it is connected to the spread of many psychological and health disorders; it has contributed to the demise of many traditional cultures and practices, and to the loss of the indigenous and place-based ways of life that these embodied; it has led to the fragmentation and hollowing out of urban and rural communities; and it is undermining the viability of many of the natural systems on which we depend. Although policy makers and the media have frequently declared that “There is No Alternative” (known as the ‘TINA’ argument) to globalization, it has been challenged in myriad ways by grassroots activists, writers, academics, NGOS, and green political parties and think tanks. Alternative approaches to economics emphasize the importance of non-material as well as material needs, and argue for the re-contextualization of the market (the economic system) in social and natural ecosystems. They argue for the development of decentralized and locally networked economic systems which allow for local and regional self-management. An understanding of the problems caused by globalization and familiarity with alternative approaches to economics is vital to transition designers as they facilitate and choreograph interventions all levels of scale to address all kinds of wicked problems. This critique of globalization is highly controversial. Do you agree with it, and if not, why not? Do you agree with the proposed alternatives to globalization, and if not why not? Globalization defines wealth in terms of monetary measures, discuss what an alternative definition of wealth might be. If growth is the indicator for economic health what would the indicator(s) be for an alternative economic system? Globalization attempts to apply a one-size fits all in terms of health and well being? Is this problematic, and if so why and what would an alternative be? Globalization is based on centralized structures and organizations such as the WTO and IMF. In what ways are these are these problematic and if so what would alternatives look like? Why is it problematic to apply metrics from the Western developed world to other cultures and societies to assess their well-being? Discuss the ways in which globalization affects your own lifestyle and everyday life, in both positive and negative ways. Discuss the ways in which designers and design practice are inextricably linked with globalization. Discuss the implications of globalization for different levels of societal systems, local, regional, national and international. This class will be comprised of group presentations followed by a class discussion. Teams are asked to use the project canvases provided to map their wicked problem and stakeholder relations in analog form. A digital presentation can also be used to supplement the work and/or demonstrate team process and additional findings. The presentations should explain the process, articulate the primary characteristics of the problem, discuss 2-3 interconnections/interdependencies that were revealed, show multiple stakeholder groups and speculate on where there potential conflicts and alignments might be. Groups should be prepared to discuss difficulties, challenges and any surprising conclusions or ‘clues’ that the assignment revealed. Teams will have exactly 10 minutes for their presentations. A brief Q&A will follow. Assignments should be submitted and documented the Team’s first Medium post. Make sure that the process is documented both in written and visual form. High quality photos that enable instructors to see the detail of maps are required (you may choose to integrate the option in Medium which enables photos to be enlarged. TEST THIS FIRST to ensure that you have uploaded photos in hi-resolution–you will be graded down for low-resolution photos in which the detail cannot be read. Write the Medium post so that it can be viewed by an outside audience who will not only learn about the problem and its stakeholders, but also the emerging approach itself. What is working, what could be improved? If you had the time and budget for research, what would you undertake first? Please see the Assignment #1a & #1b page of the website for more detailed instructions.